It is fitting that the inaugural Mid-Atlantic Wrestle Expo 2017 begins on a Friday evening, as Friday nights defined professional wrestling in Virginia’s capital city for several generations of grappling fans. It is impossible to quantify the level of excitement that the stars of Jim Crockett Promotions provided to wrestling fans in Richmond and vicinity over nearly a half century. In the early days Bill Lewis and later Jim Crockett, Sr. promoted wrestling cards that ran at the Virginia State Fairgrounds at Strawberry Hill, which in its earliest years was called the Atlantic Rural Exposition Grounds. 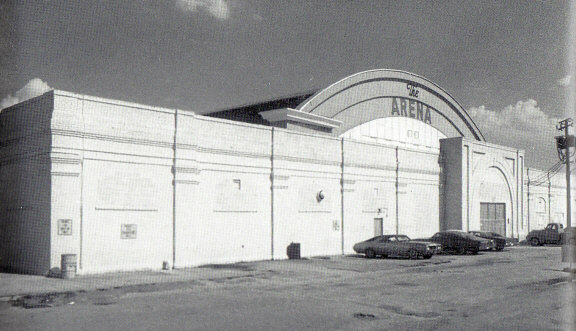 From the infancy of the television age until March of 1974, the Fairgrounds served as the principal host for wrestling in Richmond. In the spring of 1974, the aging Richmond Arena and the brand spanking new Richmond Coliseum took over the hosting roles for professional wrestling in Richmond. By the spring of 1977, the dimly lit Arena with its 5,000 seat capacity ceased being used regularly and the cavernous Coliseum, with more than double the Arena’s seating capacity, would then almost exclusively host Richmond’s cards every other week for the rest of the Crockett era. The Richmond Fairgrounds venue was a venerable “smoke filled room,” often stretched to the seams to house all the spectators that wanted to see the stars of All-Star Wrestling that they watched week-to-week on the South’s first television station, WTVR TV Channel 6. For many of its early years, the Crockett territory featured some of the greatest tag team wrestling seen anywhere in the world and the Richmond Fairgrounds was a showcase for it. In the early 1950s George and Bobby Becker topped the cards, giving way later in the ‘50s to the “Flying Scotts,” George and Sandy Scott. But it was the 1960s into the early 1970s that saw the heyday for Crockett tag teams, where Fridays at the Fairgrounds featured such legendary performers as George Becker and Johnny Weaver, Paul Jones and Nelson Royal, Rip Hawk and Swede Hanson and Brute Bernard and Skull Murphy battling each other in two-out-of-three-falls bouts that whipped the crowds into a frenzy. Those frenzied Friday night crowds regrettably gave the Richmond Fairgrounds a place in wrestling history that it would probably rather not claim. On Friday night February 11, 1966, Boris “The Great” Malenko and Bob Orton, Sr. were seriously injured after a riot broke out after the conclusion of a heated match against the beloved team of George and Sandy Scott. As bad as the incident was, it showed just how incredibly powerful the wrestlers played their respective good versus evil roles to engender such raw emotions in the spectators. In the early 1970s, All-Star Wrestling became known as Mid-Atlantic Championship Wrestling, and Jim Crockett, Jr. headed up operations of the family owned company. By this time, Joe Murnick along with his sons Carl and Elliot were the primary local promoters for Richmond and vicinity. During this same time frame, Richmond’s own Rich Landrum was doing the ring announcing at the Richmond venues, and would soon parlay that role into a position as lead announcer on Crockett’s popular Worldwide Wrestling television show during the late 1970s and early 1980s. Mid-Atlantic Championship Wrestling caught fire in the mid 1970s, and was arguably the top territory in professional wrestling over the next ten years until Jim Crockett Promotions gradually ceased operating as the Mid-Atlantic territory as it attempted to become more national in scope. During this period, the Richmond Coliseum ran mega cards with huge crowds and featured many historically significant matches. During that red-hot time frame, the Richmond Coliseum was home to multiple switches of the Mid-Atlantic territory’s most important championship titles. Particularly noteworthy was Ric Flair dropping the Mid-Atlantic Heavyweight Title to Wahoo McDaniel on December 27, 1976, effectively ending arguably the greatest feud in the history of the Mid-Atlantic area. Fast forward ahead to July 29, 1977 in the Coliseum, where Flair aced his first United States Heavyweight Title, defeating the legendary Bobo Brazil in what was perhaps Richmond’s most historically significant match. And moving into the decade of the 1980s the Coliseum saw the triumphant return to the area of the “Minnesota Wrecking Crew,” Gene and Ole Anderson, as they defeated Paul Jones and the Masked Superstar for the NWA World Tag Team Titles, the same belts the Anderson Brothers had vigorously controlled several years earlier. While Richmond, Virginia has continued to host professional wrestling events up to the present day, there was never a time where wrestling captured and held the public’s fascination like Friday nights during the Jim Crockett Promotions and Mid-Atlantic Championship Wrestling era. It was truly a golden age of wrestling that has now passed, but one that will never ever be forgotten in Richmond. "FOUR HORSEMEN" On Sale now!